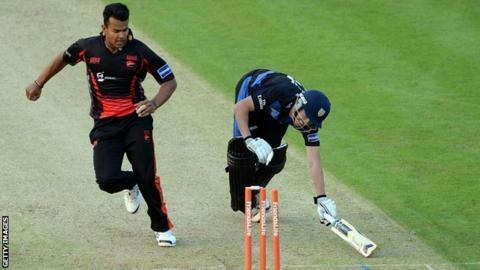 Leicestershire all-rounder Shiv Thakor is to join Derbyshire on a two-year deal at the end of the season. The 20-year-old former England Under-19s captain rejected a new contract offered by his home county. He has played 24 first-class matches, scoring 1,288 runs at an average of 39, and taking 16 wickets. "It's been tough to leave the county that has given me my start in pro cricket, but it's time to take the next step forward," Thakor said. A Leicestershire club statement said they were "disappointed" by the decision, but would not be making any further comment. "Having met with Graeme Welch and the management team, it was an easy decision to join a progressive club like Derbyshire. The way he talked with passion about the club, its plans for the future and the role he sees me playing was too good an opportunity to turn down." Derbyshire elite performance director Graeme Welch said: "He is a versatile player who can contribute with both bat and ball across all three formats. "He has shown for Leicestershire that he is a top player with England potential. The sky is the limit for the lad and I'm sure he will have a successful future in Derbyshire colours." Thakor added: "I had several options on the table but, having met with Graeme Welch and the management team, it was an easy decision to join a progressive club like Derbyshire. "The way he talked with passion about the club, its plans for the future and the role he sees me playing was too good an opportunity to turn down."